At Taylor Andrews, we highly encourage students to look into applying for grants. Grants are free money given to qualified undergraduate students that doesn’t need to be repaid. Pell Grants are the most well-known types of grants. For students who don’t qualify for grants or if the grant doesn’t cover as much of the costs as the student needs, loans are a common choice. Unlike grants, the money on loans need to be paid back, sometimes with interest. There are multiple types of loans available, with the most common being subsidized and unsubsidized loans. With subsidized loans, the federal government pays for the loan interest. Unsubsidized loans are often low-cost and have a fixed interest rate which the student will need to pay back. At Taylor Andrews, we believe money shouldn’t get in the way of our students pursuing their dream careers in cosmetology. To help our students pay for their education, we have a variety of merit-based scholarships available. These scholarships are popular and require students awarded the scholarship to claim it by a strict deadline or else it will be given to another student. There are often course limitations and restrictions in order to utilize the scholarship. Our scholarships are great compliments to grants and loans to help cover the costs of fees, materials and books for school. Some students choose to forgo loans, grants and scholarships and pay for their schooling themselves. Sometimes, while these students are financially able to pay for their courses, they aren’t able to pay the costs in full in one lump sum. This is where our affordable, flexible payment plan comes in. The Taylor Andrews payment plans come with a fixed, low interest rate and the option to make 12-18 monthly payments. All our payments require students to pay a $3,000 down payment up-front. The full cost of tuition is expected to be paid by graduation. Besides the more traditional ways of grants, loans and scholarships to get money for cosmetology school, there are other financial aid sources available. Students with disabilities and who reside in the state of Utah are eligible for school and job placement assistance through the Utah State Office of Rehabilitation with the goal of increasing their independence. Students who are veterans of the armed forces, their dependents and survivors can receive financial aid and employment assistance through the local VA. Some students already know they want to go to cosmetology school while still in high school. Most financial aid options for college, however, are geared to students who have already graduated high school. Taylor Andrews is proud to support aspiring cosmetologists from local high schools in their pursuit of higher education at our cosmetology school. We partner with various high schools in the Alpine School District and match the school district’s partial tuition scholarship. Attending cosmetology school can cost more than you’d like and the expenses can prevent you from moving forward in pursuing your dream career. Fortunately, there are many financial aid options available. 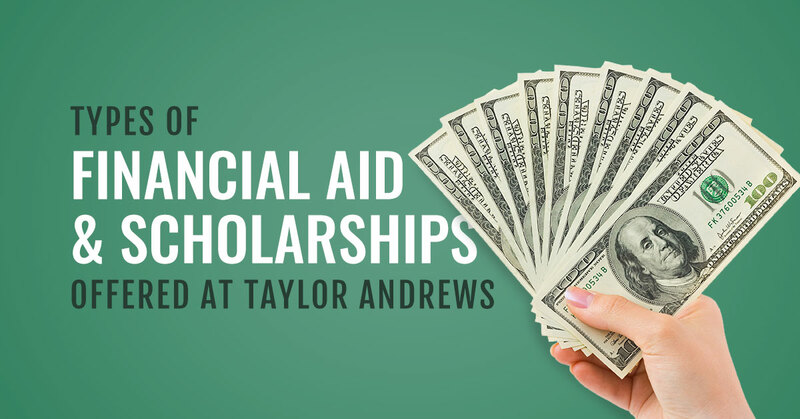 If you have your eyes set on attending Taylor Andrews, we have compiled some financial aid resources on our website that you may want to check out. Feel free to contact us with any additional questions you may have.